The National Oceanic and Atmospheric Administration (NOAA) recently signed an enterprise license agreement with Esri, the world leader in GIS technology. The agreement enables NOAA to continue building its GIS platform while maintaining data quality in bathymetry, climate and weather data, navigational charting, fisheries protection, natural resource management, marine planning, and other areas of its mission. All NOAA employees now gain unlimited access to select Esri desktop and server products, including the powerful ArcGIS for Desktop, ArcGIS Spatial Analyst and 3D Analyst extensions, and ArcGIS for Maritime. In addition, NOAA staff members gain unlimited access to Esri’s Virtual Campus for online training, discounts on Esri technical support and classroom training, and complimentary passes to annual Esri user and developer conferences. Another benefit of the agreement is a subscription to Esri’s ArcGIS Online. This benefit allows NOAA to quickly create interactive maps and applications and share these with the rest of the organization and the public. “The agreement provides a foundation for the development of an enterprise geospatial program for NOAA, which will likely result in increased efficiencies across the organization, enhanced access to NOAA data and services, and a streamlined acquisition process,” states Joe Klimavicz, NOAA’s chief information officer (CIO). For more information about enterprise license agreements, visit esri.com/ela. Esri’s ArcGIS technology has a long history of driving environmental understanding and decision making. Policymakers, planners, scientists, and many others worldwide rely on GIS for data management and scientific analysis. GIS users represent a vast reservoir of knowledge, expertise, and best practices in applying this cornerstone technology to climate science, carbon management, renewable energy, sustainability, and disaster management. Esri Video: http://video.esri.com/watch/2538/the-urban-observatory-with-jack-dangermond-and-hugh-keegan — Jack Dangermond and Hugh Keegan introduce the Urban Observatory and how it allows people to explore simultaneous views of major cities located around the world. Esri Video: http://video.esri.com/watch/2167/new-landscape-data-and-apps — Suzanne Foss demonstrates landscape services. Esri Video: http://video.esri.com/watch/1646/maps-can-change-the-world — John Calkins shares his thoughts on the importance of maps. Esri Video: http://video.esri.com/watch/981/meet-dawn-wright-esris-chief-scientist — Dawn Wright discusses her role as Esri’s Chief Scientist and how GIS technology integrates environmental, conservation, climate, and ocean science into many applications. Esri Video: http://video.esri.com/watch/1650/ocean-gis — Esri Chief Scientist Dawn Wright, and Will McClintock and Chad Burt of the University of California, Santa Barbara, discuss and demonstrate the efforts made in ocean GIS with SeaSketch, a new web-based solution. Esri Video: http://video.esri.com/watch/47/gis-in-education-_dash_-bigfork-high-school-cave-club_comma_-bigfork_comma_-montana — Gil Grosvenor, Board Chairman, National Geographic Society, talks about the National Geographic GeoMentor program. Bigfork High School graduated seniors Tia Bakker and Ernie Cottle, along with teacher Hans Bodenhamer, then demonstrate their efforts to conserve caves in Glacier National Park. They identified concerns such as graffiti and ecological factors such as cave fragility. They used their finding to make conservation recommendations to help the park protect the caves. Esri Video: http://video.esri.com/watch/2536/a-national-gis-for-indias-development-with-sam-pitroda — Sam Pitroda, adviser to India’s Prime Minister for Public Information Infrastructure and Innovation, highlights India’s efforts to solve its challenges with geospatial technology. Esri Video: http://video.esri.com/watch/2174/living-well-within-the-planets-boundaries — Jacqueline McGlade, Executive Director of the European Environment Agency shares her strategic initiative on preserving the future of planet Earth. Esri Video: http://video.esri.com/watch/1652/keynote-international-union-for-conservation-of-nature — Julia Marton-Lefèvre, Director General of the International Union for Conservation of Nature, discusses an important project that uses GIS to document plant and animal species threatened by extinction. Vimeo: https://vimeo.com/29114636 — The 2011 Jane Goodall Global Leadership Awards were presented on September 24, 2011. This year’s winner for Excellence in Conservation Science was Esri. This award is given to a company or organization dedicated to developing innovative research and technology to protect and restore our natural world and to improve the well-being of all who live in it. Esri TV (YouTube): http://www.youtube.com/watch?v=k5HbtQL5pVg — Jane Goodall describes Roots and Shoots, a youth organization related to the Jane Goodall Institute (JGI) that is devoted to empowering children in learning about their environment and working together. Esri Video: http://video.esri.com/watch/1651/earthwatchers — Eduardo Dias of Geodan discusses Earthwatchers, a grass-roots program involved in rainforest conservation. Esri Video: http://video.esri.com/watch/143/dr-sylvia-earle-talks-about-the-role-of-gis-in-ocean-conservation — Dr. Sylvia Earle, oceanographer and former chief scientist for the United States National Oceanic and Atmospheric Administration (NOAA), gives the keynote presentation at the 1999 Esri International User Conference. EDEN is freely available and was developed in close collaboration with climate scientists. EDEN employs interactive visualizations and statistical analytics for understanding of earth system simulations and climate change. 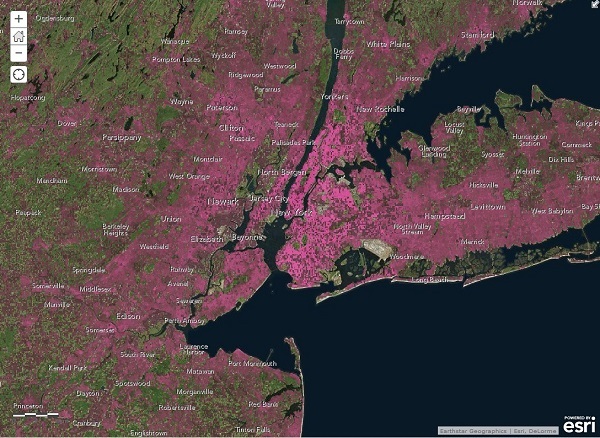 Bridges the growing gap between viable visualization techniques and real-world climate analysis. Exploratory analysis of real-world CLM data sets using interactive parallel coordinates and other coordinated views augmented by statistical analytics. Visualizations permit visually forming multi-faceted selections using information scent to guide the scientist to the most promising relationships. “Rapid increases in high performance computing are feeding the development of larger and more complex data sets in climate research, which sets the stage for so-called “big data” analysis challenges. However, conventional climate analysis techniques are inadequate in dealing with the complexities of today’s data. In this paper, we describe and demonstrate a visual analytics system, called the Exploratory Data analysis ENvironment (EDEN), with specific application to the analysis of complex earth system simulation data sets. An early version of EDEN is used to visually analyze a 1000 simulation CLM4 point ensemble data set with 81 parameters and 7 output variables on ORNL’s EVEREST power wall facility which offers 11,520×3072 (35 million) pixels.